Ok, a little history here. There's that famous recipe. The one with eleven herbs and spices. The one we all had at one time or another in Western Fast Food. It's pretty good. I have had it before, and I'll probably have it again. There are a lot of attempts to duplicate it or at least come close. Many professional chefs have tried, with varying results. I'll allow you to search for your favorite. At one point the Chicago Tribune newspaper published an article saying that the recipe they had was The Original KFC recipe. They weren't sure completely, but it made for a good story. More correctly, it is alleged by a family member that this is the recipe that Harland Sanders used to make his chicken. Do go read that link at the Chicago Tribune. The writer told a wonderful story and the Trib definitely deserves the read and my own thanks. I had to try it. Or rather, I had to try that printed recipe "My Way". And THAT is why I say "Alleged" above. You see, when I made this, it turned out great. But it had too much pepper in it. Black pepper specifically, so when I make it next time, I will tweak it for my tastes. Otherwise I really did like the chicken that I got. So much that I will be eating some today for lunch in a big bowl with rice. If you like KFC chicken, either go to a proper KFC and get it there, or go through the work of figuring this one out yourself. 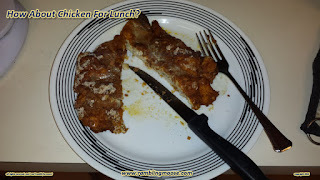 While I have no personal information other than the article, and I can not say whether this is absolutely KFC's original recipe, it tastes so much like my own memory of it that I'll keep making it for myself. Yes, it is worth the time and effort. Yes, I will do it again. Is it truly KFC? Dunno but it's damn close! There is a Buttermilk Marinade for 30 minutes that I of course skipped since there is no Buttermilk in the house. You can substitute milk. You can also skip it. I would expect the Buttermilk to add a little moderation to the spices and tenderize the chicken due to the acid. I pressed the chicken breasts by using a meat mallet, but obviously that isn't necessary since the KFC restaurants are selling mostly chicken parts with bone in. I used breasts because that was what I had here on hand. Pressing De-boned chicken makes for a more uniform thickness and therefore a more "controlled" result when baked. 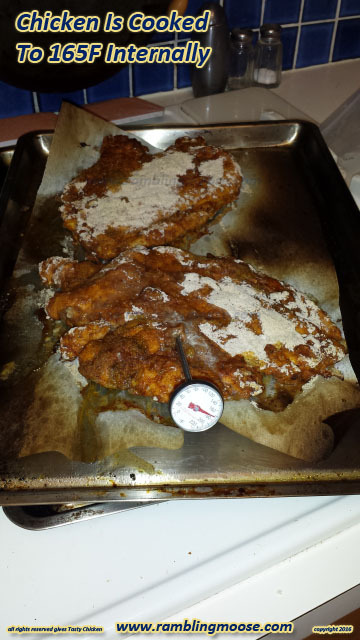 Breasts were dredged through a scrambled egg wash, then generously dipped in the flour and spice mixture. This mixture will make enough for about five pounds or two and a quarter Kilos for my non US Audience. Hello, folks from Sunny Florida! 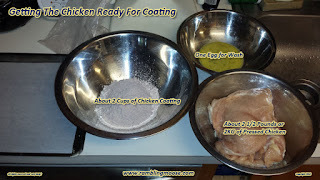 I split the coating in half and it worked out great for my 40 ounces of chicken parts or 1.1 KG (or so). I did not have Celery Salt on hand. I substituted 1/2 the amount of ground Celery Seed. There does seem to be quite a bit of salt in this recipe to begin with. I baked the chicken parts on a cookie sheet at 450F 230C for 15 minutes and tested to make sure that it was cooked to an internal temperature of 165F or 75C. Thicker pieces were returned to the oven until they reached 165F. This picture below is a direct link to the Chicago Tribune graphic, but will be explained in case that link disappears. What that well loved recipe says is to add to two cups of flour the list of 11 herbs and spices. The "Ts" are Tablespoons. It makes a bit more than 3 cups of coating. Since this is "cooking" instead of "baking" if you're a wee bit off, you should be fine. It isn't like making bread or a souffle! Nice thing is that since Recipes are never patented in the US, we can share and enjoy. But I would say the nicest thing about making this recipe is that once you're done, you will be craving for your nearest KFC restaurant. Get the biscuits and gravy as a side. My own final verdict is like I said before, I will do it again but I will cut back on the black pepper. I did have a heavy hand in coating the chicken which is why there's a strange powder on some of the pieces. If you actually deep fry the chicken, that extra will cook and turn brown. Baking is a bit less forgiving of my own mistakes when it comes to over-coating your chicken. Now that I am sitting here, reading and re-reading my writing... well lunch is coming and I'm looking forward to more of this recipe chicken!